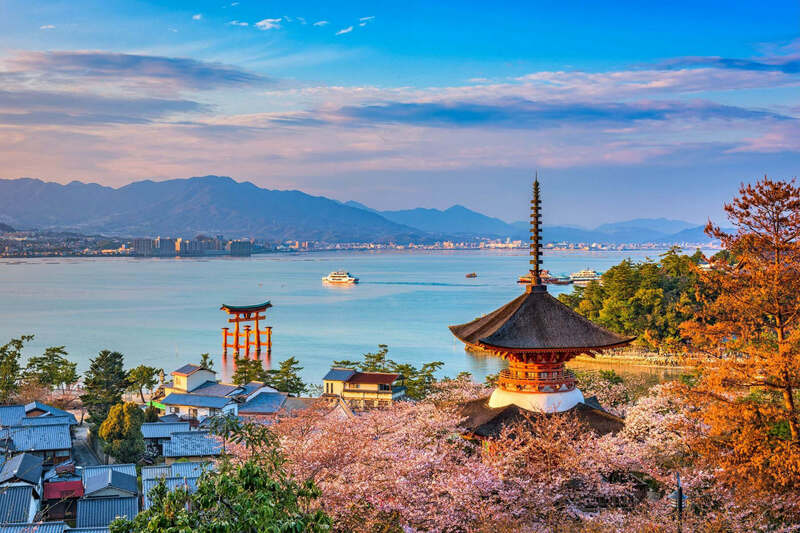 Lying just offshore in Hiroshima Bay, the historic island of Miyajima is one of the prefecture’s most famous sites. 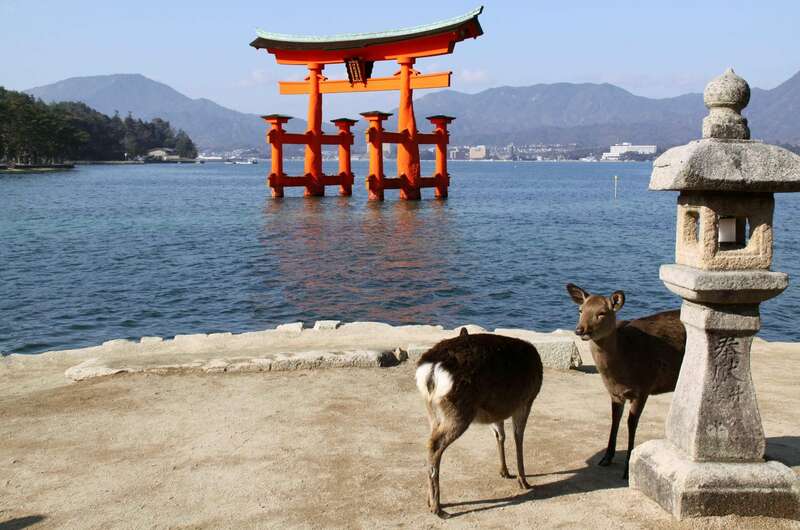 Also known as Itsukushima, both of its names refer its most iconic spot, the Itsukushima Shrine. The island has many charming walking paths that surround the town, some leading through the Momijidani (Maple Valley) which is the island’s prime fall foliage spot in autumn. In spring, the paths also lead through clusters of cherry trees which bloom in early April. The island’s most important site is the namesake shrine with its famous floating red torii gate – Hiroshima’s most popular icon. 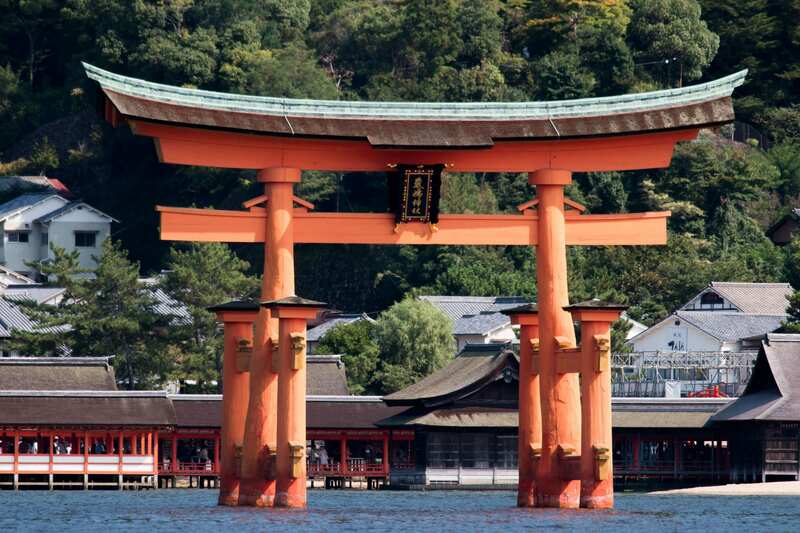 The torii itself is one of Japan’s official Top 3 Sights, while the entire shrine is a UNESCO World Heritage site. Founded over 1,400 years ago, and rebuilt numerous times, the Shinto shrine seemingly “floats” on water at high tide (at low tide, it’s part of the beach). As the island was considered sacred, the shrine was originally built over water to detach it from the land, keeping the island “pure” while allowing “impure” commoners to still visit the temple. Traditionally, boats had to arrive at high tide, floating through the torii gate. The shrine houses the renowned Heike Nokyo, an ancient set of 32 lavishly decorated sutra scrolls gifted by its patrons, the Heike Clan in 1164; the scrolls are now considered one of Japan’s national treasures. The shrine is open year-round, and if you’re lucky you can even attend a traditional Noh performance in the main prayer hall overlooking Hiroshima Bay. The shrine is also lit up nightly, making it an unforgettable site. While the island is home to 2,000 people, its most famous residents are the local sika deer (Japanese spotted deer). Once seen as messengers of the Shinto gods, it was forbidden to hunt them – a crime that used to be punishable by death. Since then, they’ve flourished, with a population of over 1,000 today which can be found wandering everywhere, and are known to be extremely curious and always on the look-out for a snack (it’s forbidden to feed them). 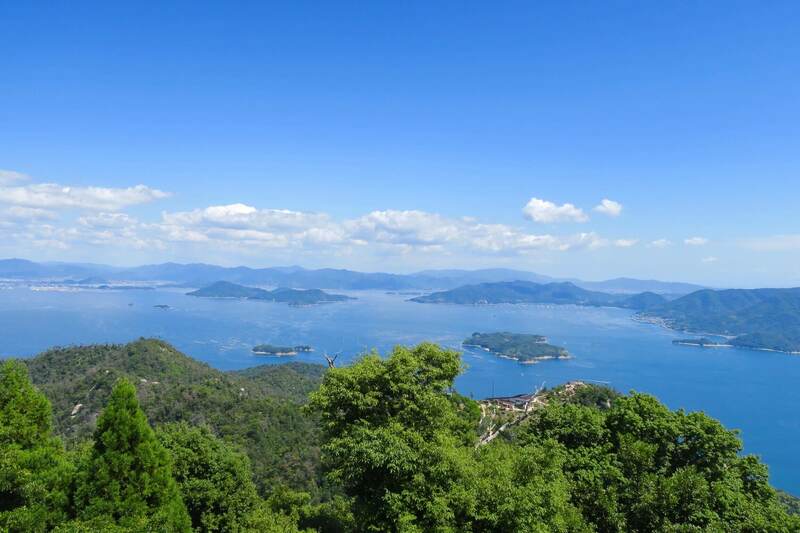 One of the best ways to see Miyajima is from the 500m summit of Mt. Misen. There’s a convenient ropeway up to the Shishi-iwa Observatory, as well as three designated trails leading to the top (2 hours, one-way). 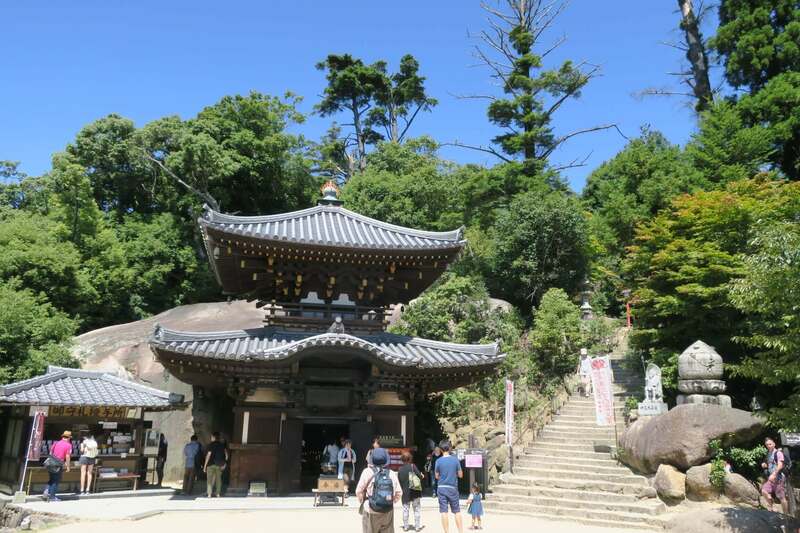 At the foot of the mountain is Daisho-in, one of the most important temples of Shingon Buddhism. In addition to religious buildings, there’s also a tea room and a cave filled with 88 icons representing the Shikoku Pilgrimage. You can perform the Buddhist ritual of spinning metal sutra wheels when walking up the temple’s steps. Miyajima is actually part of neighboring Hatsukaichi City, but easily reached from downtown Hiroshima. It’s less than 30 minutes by train (or tram), to Miyajimaguchi Station followed by a 10-minute ferry ride. There are also direct boats from the Peace Memorial Park (1 hour), or Hiroshima Port (25 minutes).